Jeans are a fashion staple that will never really go out of style. They are the must-have piece for every wardrobe. They can be found in so many different styles and that is why most of you have more than one pair. The most popular type of jeans are the skinny ones, but if you wish to make a statement and stand out from the crowd, you may choose to get yourself some boyfriend ones. Boyfriend jeans are usually baggy and distressed. They can be found in versatile styles and there are many ways to style them. They look great when styled with sneakers which gives you the perfect casual look, but you can also rock this trend with a feminine twist. One such way can be to pair them with prints. For instance, a floral blazer or top will look great in combo with your boyfriend jeans and some heels. Also, you can pair them with some dressy top to create a balance and thus keep your look from being too masculine. Accessories are also really important when aiming for a feminine look. Some fancy heels and a posh purse, can instantly change the look, as well as some statement jewelry, like necklace or a pair of earrings. Go ahead now and see some of the street style looks from your favorite fashion bloggers and get inspired to wear boyfriend jeans more often. Enjoy! Boyfriend jeans can be found in versatile styles. Some of them can be just baggy, maybe a little bit cuffed. Others can be ripped, either slightly distressed or with bigger holes on the knees. 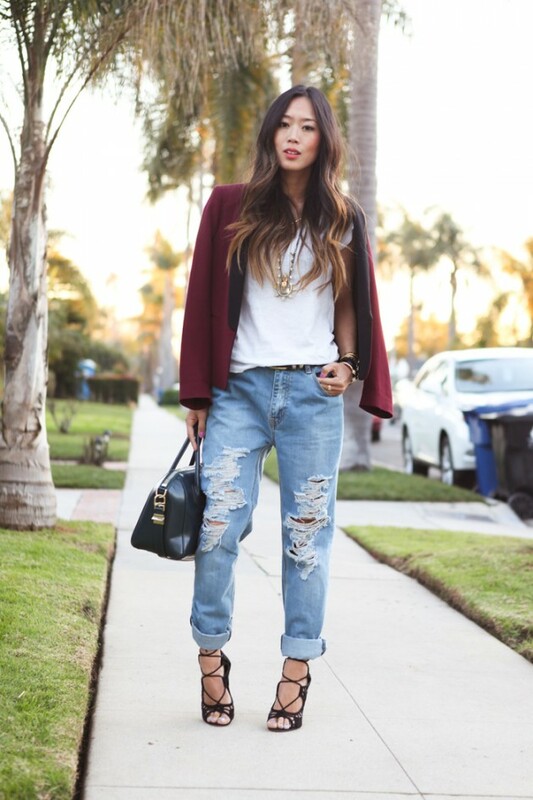 Boyfriend jeans can look great in combo with all types of heels, especially with stiletto ones. Also, they can look good when combined with lace up or ankle striped heels. Make sure to cuff them and thus have the chance to show off your shoes. Having them cuffed will also help you avoid adding the non-existing pounds to your fame and shortening the length will balance the bagginess. So, which one from the above looks with boyfriend jeans did you like the best? Tell us in the comments and do not hesitate to pull off this bold trend as soon as possible. Thank you for reading and don’t forget to stay up to date with the content of Fashionsy to keep up with the latest fashion and beauty trends.